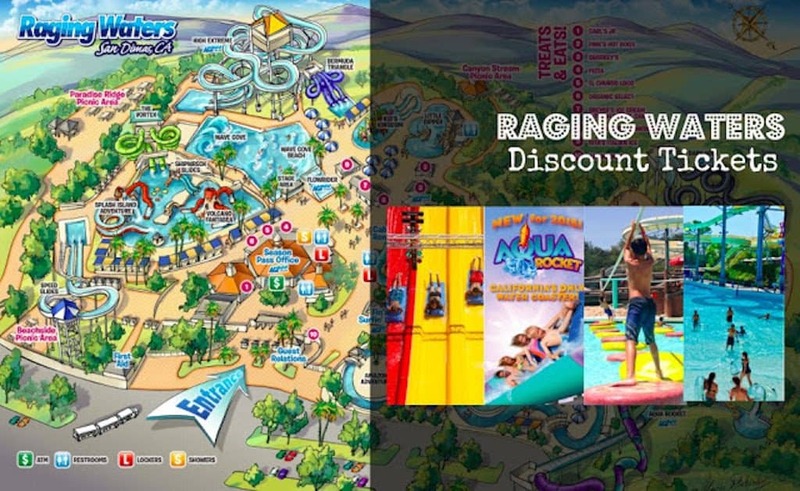 Cool off with Raging Waters Discount Tickets: $20 VS. $45.99. Visit California’s largest water park this summer. Raging Waters Los Angeles has 50 beautifully landscaped acres of slides, attractions and its own sandy beach. Enjoy rides, slides, waves, rivers, and pools. There are also various kiddie attractions. Details of all fun things you can do at Raging Waters San Dimas below. disclosure: this post may contain affiliate links. Photo by Raging Waters. No Raging Water coupon required to avail of deals. Are kids free at Raging Waters? Guests under 36″ tall are free. H2Go Pass can be purchased online or at the H2Go Booth, limited quantity only. Prices vary. Raging Waters offers some of the best attractions in Los Angeles! Single riders can take the daring plunge down Drop Out, a seven-story drop that reaches nearly 40 miles per hour in just four seconds, and twist and turn down other slides such as, The Vortex, The Bermuda Triangle, and more! There are plenty of two-person slides and body slides to enjoy, too. Feel the adrenaline rush on the Aqua Rocket, a four-person rocket style raft merging the excitement of a roller coaster and the thrills and spills of a water ride. If you’re looking for a little R&R, grab a raft and take a relaxing float down the Amazon Adventure river. Or make a splash at Wave Cove, a wave pool that simulates true tidal movements. Whether you’re mild, wild or somewhere in between, guests of all ages can have a raging time! Raging Waters Los Angeles has four fun areas just for kids: Kid’s Kingdom, The Little Dipper, Splash Island Adventure, and Volcano Fantasea. Kid’s Kingdom, a 30,000-square-foot water playground, is just for children. This attraction invites youngsters to scoot about in a maze of plastic tubes and tunnels, slip down slides, swing from bars, and shower under waterfalls. Must be under 48″ tall to ride. Splash Island Adventure. This is a family-oriented tropical-themed adventure which features 12 levels and 75 activities–including five slides, water cannons, web crawl tunnels, spiral cargo nets and swinging bridges. Splash Island’s centerpiece is a 1,000-gallon bucket atop a five-story tower that tips hundreds of gallons of water over the whole attraction every few minutes. The Little Dipper is a pint-sized paradise which features miniature slides, wading pools, fountains and waterfalls. Must be under 48″ tall to ride. Volcano Fantasea features a giant volcano towering forty feet over a crystal blue lagoon. Children and parents alike can climb through the volcano and glide down twisting slides to the water below. Ragin’ Racer and Thunder Rapids. Some days they open at 10AM or 11AM, and closes 5PM or 6PM, it varies by date. Parking is $20 per car. Season parking pass is $79.99. Cash Only. Does Raging Waters have lockers? All day Raging Waters locker rentals are available for a nominal fee and are located in four areas, including: Main Gate near Carl’s Jr., Neptune’s Fury and Turtle’s Trading Post. $20 for large, $15 for standard. Is food allowed at Raging Waters? No outside food or beverages are allowed inside the park. Raging Waters has a wide selection of places to eat.